I found the recipe on one of the many food blogs I read. It looked fun to make so I tried it and it came out really good actually! 1)Preheat oven to 350F. Line a 9-inch round cake pan with a circle of parchment paper and lightly grease the bottom and sides of the pan. 2)In a large bowl, mix together eggs and sugar until mixture is light and creamy and the sugar has mostly been dissolved. Stir in milk, vegetable oil, vanilla and almond extracts. 3)In a medium bowl, whisk together flour, baking powder and salt. Pour into wet ingredients and whisk to combine. Measure out just over two cups of vanilla batter and place it back in the medium bowl. Sift cocoa powder over the bowl and whisk until fully incorporated. 4)Put 3 tbsp of vanilla batter into the center of the pan and let it spread slightly on its own. Put 3 tbsp of chocolate batter in the center of the vanilla. It will push out the other batter and, as it sits for a moment, will also spread itself. Alternating spoonfuls of the two batters, repeat the technique until all the batter has been used up. 5)Bake for 38-42 minutes, until the cake is light gold and a tester inserted into the center of the cake comes out clean. 6)Let the cake cool in the pan for 10-15 minutes, then turn out the cake and remove the parchment paper. Move on to a wire rack and let cool before slicing. We had a lot of extra beef tenderlion leftover and instead of making steaks out of all of it, we wanted to try something different, so Chris searched and found this recipie yesterday. In a medium pot over medium to medium high heat add a tablespoon of oil and a tablespoon of butter. When butter melts, add chopped mushrooms and saute 3 to 5 minutes. Add water and cover the pot. Add rice and pilaf packet to water. Stir to combine, reduce heat and cook 18 minutes. Add parsley, fluff with fork. Preheat a large skillet over high heat. Add vegetable oil to really hot pan. Add meat and sear on all sides, 5 minutes. Season with salt and remove to a plate. Cover meat loosely with foil to hold heat. Reduce heat on pan to medium. Add butter to pan. Add peppers and a little onion. Saute peppers and onions 5 minutes. Sprinkle flour over vegetables and cook 1 minute longer. Whisk in sherry and start to pick up pan drippings. Whisk in consomme and continue whisking. Add tomato and black pepper. Slide meat back into the pan and coat with sauce. Reduce heat to low and simmer 5 minutes. Spoon Pepper Steak over Mushroom Rice Pilaf and serve. 1) Wash and cut out tops of peppers, make sure you get all of the seeds out. 2) Cook the ground meat and rice as you would normally. 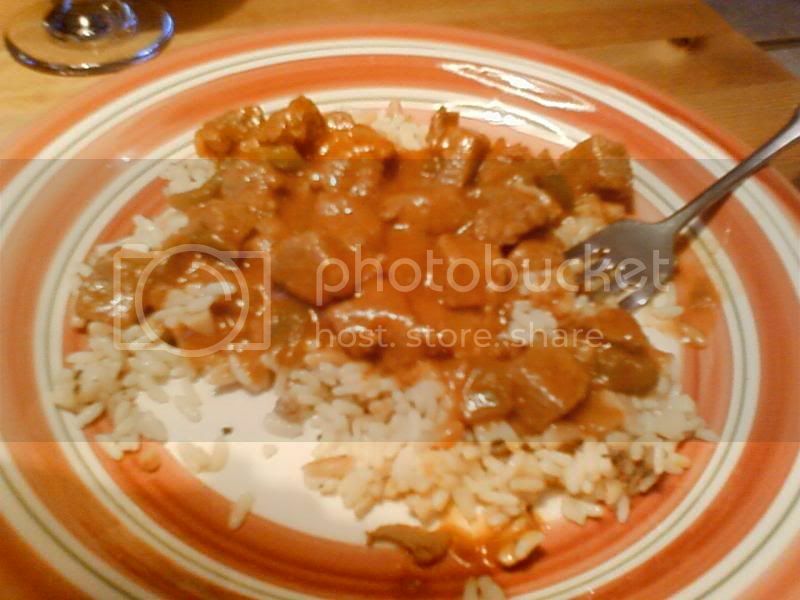 3) Mix all ingredients together, add meat and rice once cooked, use hands to mix it all together. Save a little of the tomato sauce to put on top while baking. 4) Pre-heat oven to 350 degrees. 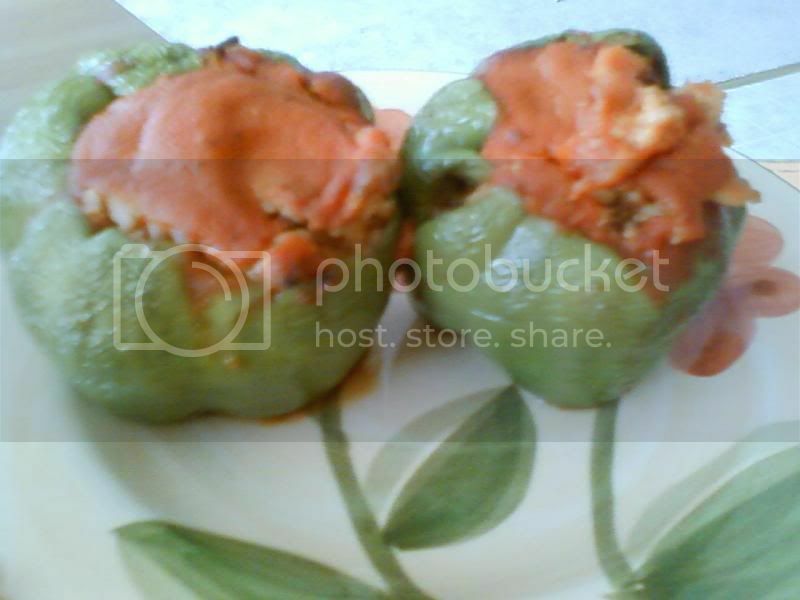 5) Stuff peppers with mixture, add some tomato sauce to top of pepper. 6) Bake 1 hour, and basting every 15 minutes with the tomato sauce.